Ghirardelli's White Chocolate Flavored Sauce offers a smooth and creamy white chocolate flavor. Perfectly formulated for use in espresso-based drinks, this sauce is also great as an ice cream, frozen yogurt, or dessert topping. Perfect Topping For Frozen Yogurt! Enjoy the unsurpassed quality and taste of Ghirardelli® sauces. 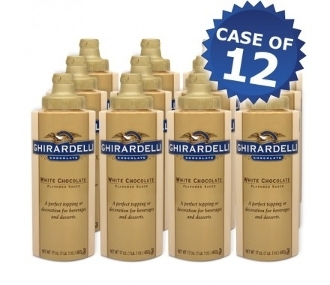 Premium Ghirardelli® White Chocolate Flavored Sauce in a convenient squeeze bottle format.